What an amazing wedding day this couple had! The weather was perfect, we had plenty of time to create wonderful wedding pictures and the couple was as enthusiastic about their wedding photography as any couple I’ve ever had the privilege and pleasure of working with. We started our day in the bridal suite at The Hyatt Regency Long Island at The Wind Watch Golf Club in Hauppauge, New York. The upper level suite provided sweeping views of Long Island as this fine hotel is built on one of the Island’s highest points. After taking a ton of pictures of the bride, her maid of honor and her bridesmaids getting ready we went down to the hotel lobby where the reveal took place...when the groom saw his bride in her wedding gown for the first look. The bridal party climbed in their limousines and we travelled to The Bayard Cutting Arboretum in Oakdale, NY where we walked around the breathtaking grounds and took hundreds of pictures of the couple and their attendants. 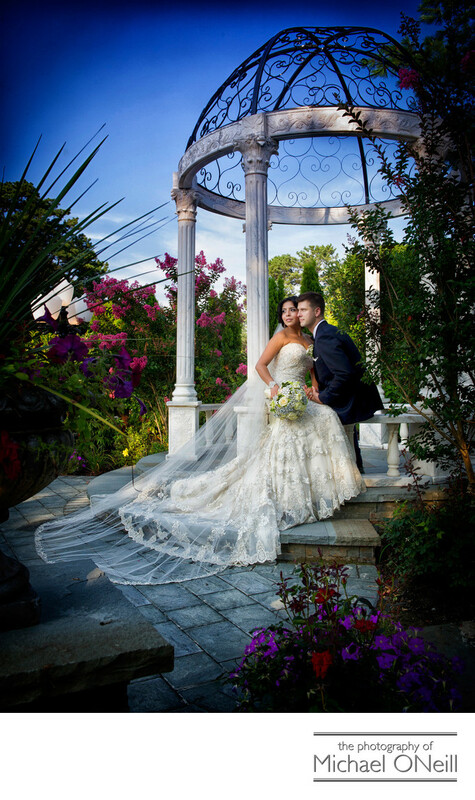 Finally we travelled to their ceremony and reception venue, Villa Lombardi’s, in Holbrook, NY. This shot was taken in one of Villa Lombardi’s impeccably manicured gardens. The amazing gazebo in the picture is a recent addition at this luxurious venue. Not only did it provide a wonderful background for this photograph, but it was also used for the couple’s wedding ceremony. They exchanged vows and wedding rings under this structure alongside the beautiful Koi pond and gardens. Afterwards their guests were treated to some of the finest catering available anywhere on Long Island. The Lombardi family is famous for their food, their service and their extraordinary locations which also include Lombardi’s on the Sound, a spectacular waterfront venue in Port Jefferson, NY -and- Lombardi’s on the Bay on The Great South Bay in Patchogue. I have been affiliated with the Lombardi family for more than 20 years and have extensive experience creating amazing wedding photography at all of their venues.